Do you want to visit the hotbed of Indian culture and learning? Then pack your bags and set out or Varanasi today! 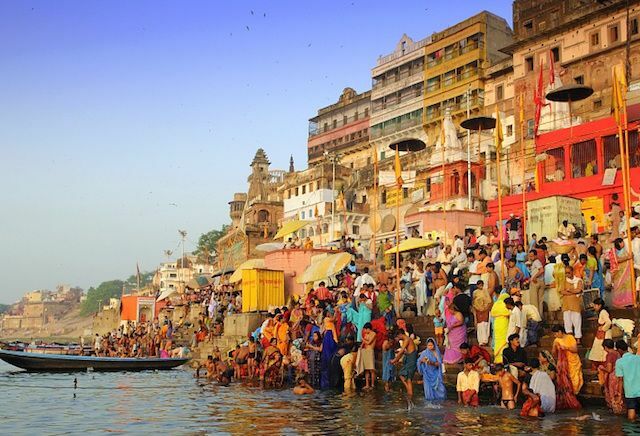 Revered as one of the most holy cities by the Hindus, Varanasi happens to be a seat of civilization, which had come into existence more than 3000 years ago. Today, thanks to its rich past and heritage, it happens to be one of the most frequently visited tourist destinations in India, both by Intra-national as well as international tourists. This age old city of Varanasi has a story to tell of its own. It has always been populated, no matter who has come or gone or whether the times have been good or bad. Thus, Varanasi today stands tall as a city that has seen a lot and survived. Since it is a tourist destination, you will find quite a number of 5 star hotels in Varanasi, some of which are located on the ghats, just overlooking the river Ganges. Why Visit the Holy City? There are mainly two reasons because of which people visit this city. First and foremost being steeped in Indian culture, this is one of the ideal places to get the flavour of India. The good here is extremely delicious as well, and you have great arrangement for accommodation, due to which Varanasi or Benaras is one of the most convenient tourist destination. The evening offerings to River Ganga, on the two ghats are a vision in itself. People hear about it from even the most faraway countries and come here to witness this splendour of lights. This is a very throbbing and pulsating city, through which the life of the entire civilization can be grasped. Another main reason, due to which only intra-national visitors throng to this place is because it is believed by Hindus that a man who’s ashes are deposited in the river here after cremation becomes free of this cycle of life and death and hence attains complete liberation from this material world after death. Thus, you will see tons and tons of people, belonging to this religious faith, who come to Varanasi every year for this purpose. It was the Aryan settlers who came settled down on the left bank of the river Ganges, a settlement which flourished into a seat of civilization. It was from the very beginning a steeped in what is identified today as Hindu culture. Varanasi slowly emerged into a centre for learning. Sarnath is just a few kilometres away from here, and it is the place where Gautama Budhha, after he had attained enlightenment had preached his first sermon to a group of people who had become his followers. This city has seen various rise and fall in its status. It was negatively affected during the Muslim invasions but had regained their status during the time of Akbar, only to suffer another blow during the reign of his great grandson. Yet, Benares still stands tall and firm to this date. If you look out of the window of your riverside 5 star resort in varanasi, you will see the river peacefully flowing at its own pace, carrying the timeless history of this city with her. This is a city like no other. Only upon visiting Varanasi once, will you realise its charm and grandeur.